Critical thinking is a disruptive cognitive process that explores alternative ways of thinking about something with the purpose of uncovering silent and untold meanings. Critical thinkers do not settle with the obvious and the taken for granted. They always delve into the deep layers of meaning and engage in profound intellectual altercations to formulate a better and holistic understanding. In a world where information obesity is the norm, critical thinking skills become essential survival skills. They can make a whole difference between information and disinformation. 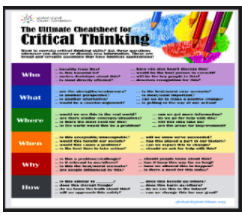 What we have for you today is an excellent infographic on critical thinking created and shared by the folks in Global Digital Citizen. The visual features 48 questions ‘that work to develop critical thinking on any given topic’. These questions are arranged into 6 main categories each of which is labelled after the following question words: Who, What, Where, When, Why, and How. Of course, the list of questions is not exhaustive and as a teacher you can use it with your students in reading or literacy activities to help them elaborate on topics, discover new information, and critically assess perspectives. It is a great way to give them practice on critical thinking. This visual is also available for free download in PDF format from this link.